There's a housing shortage in the Florida Keys. This is one of the biggest problems nearly a year after Hurricane Irma hit the area. Thousands of homes in the Keys were destroyed in the storm, and it drove up the cost of housing on an island chain that's long been one of Florida's most expensive places to live. NPR's Greg Allen reports on a new partnership that's building affordable homes for people who live and work there. GREG ALLEN, BYLINE: People in the Keys call themselves Conchs after the large sea snails found and eaten here. On Big Pine Key, Christine King demonstrates the conch shells are also good for something else - making noise. ALLEN: It's coming up on a year since Hurricane Irma, a Category 4 hurricane, blasted through this island chain. Irma made landfall about 10 miles from the mobile home where King was living. She evacuated and is glad she did. A several-foot-high storm surge swept through her neighborhood. CHRISTINE KING: I mean, it just washed everything away. And the roof came off, and a couple of walls fell down. And so it was pretty well-demolished. ALLEN: King is living temporarily in a FEMA trailer while she tries to figure out how to rebuild. Mobile homes like hers are no longer allowed in the Keys. Building a new home would cost $200,000 or $300,000, money she doesn't have. Despite all that, King, with true Conch spirit, is smiling. KING: They had come through my house with cadaver dogs looking for dead people. They found zero dead. That zero was me. ALLEN: There are thousands like her in the Keys - people washed out of their old homes and still looking for a new place to live. GEORGE NEUGENT: Housing is definitely the hardest part. And affordable housing - affordable workforce housing is the key. ALLEN: George Neugent, a commissioner in Monroe County, says since the storm, bartenders, fishing guides, hotel clerks and others vital to the Keys' tourist economy have been priced out of the housing market. NEUGENT: For example, you cannot find a two-bedroom, two-bath house for less than $2,500 a month here. And people working in the lodging industry and the hospitality industry just don't make enough money. You almost have to make a hundred thousand dollars a year to make ends meet. ALLEN: Without an affordable place to stay, many who were renting have simply left the islands and gone elsewhere. Neugent says the county is studying the issue, but he believes that since Irma, there's been a 10 to 15 percent decline in the population here. One factor is the high cost of land. In part because of environmental restrictions to protect endangered wildlife, only a small number of new building permits are issued each year, driving up real estate prices. Stephanie Kaple says another challenge is the high cost of construction. Kaple heads a coalition of nonprofits all working on the housing issue. STEPHANIE KAPLE: We are a chain of 137 miles of islands. It's a lot of bridges. We don't have some of the same things that others do. There's limited resources for us. We're working on a big project now to get volunteer housing developed 'cause groups want to come help, and we don't even have a place to put them. ALLEN: After months of work, there are now a few projects underway. With $2 million in help from the county, a private developer is soon breaking ground on a 200-unit workforce housing complex near Key West. 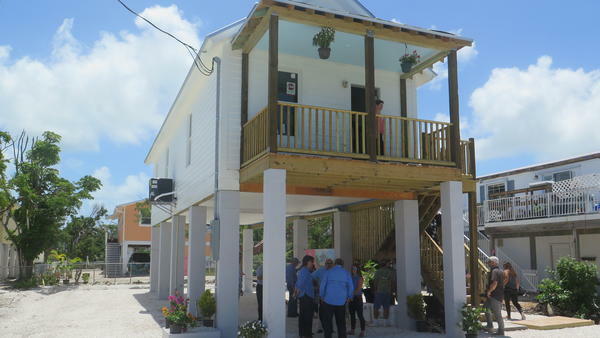 And last week, another project was unveiled on Big Pine Key. ALLEN: A new group, the Florida Keys Community Land Trust, held a ribbon cutting for its first project - a small, 760-square-foot cottage elevated and built to FEMA standards. It's one of several planned homes that will serve as workforce housing. Maggie Whitcomb, one of the Land Trust's founders, says rent will be capped at about a third of each household's income. MAGGIE WHITCOMB: So that enables a family to save, to vacation, to live without working two jobs, three jobs. ALLEN: It's a small but significant step that offers hope to those still struggling to recover from last year's hurricane. Greg Allen, NPR News, Big Pine Key, Fla. Transcript provided by NPR, Copyright NPR.